Towing the world’s largest container ship may not appear to be an easy task, and yet the CMA CGM MARCO POLO proved an ideal partner for just such an exercise carried out by one of France’s emergency towing vessels, the Abeille Bourbon. On Saturday 9 March, having just completed her tour of North Europe ports, this giant of the seas was sailing to the Mediterranean then Malta, on her way to China..
Off the Brittany coast, there was a four-hour pause in service for the vessel to undergo this exercise. It was organised by the Atlantic maritime prefecture keen to confirm that rescue means were sufficient to assist the really big commercial ships. 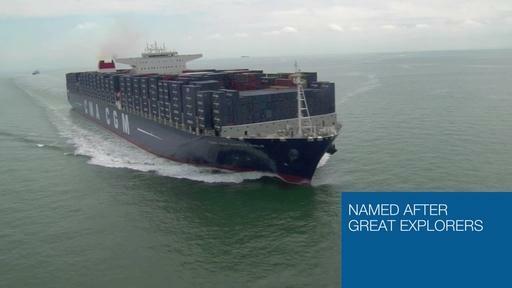 And what better candidate than the world’s largest container ship for the challenge! At 396 metres in length, loaded to 80% of her maximum capacity and weighing over 250,000 tonnes, the CMA CGM MARCO PÖLO was so docile that the Abeille was able to do the job using only half her engine power. The tug, based in Brest, took just 15 minutes to get the line in place before towing the giant for an hour at a speed of 10km/h. Every stage of the exercise went smoothly, from the moment the Marco Polo stopped and started to drift, to taking up the tow line, tensioning it, the two vessels going upwind and lastly the release and recovery of the line. Concerned always about safety and respect for the environment, CMA CGM shows that the Group is not allowing itself to be overtaken by events in the gigantism race and is prepared to invest in risk prevention means. The Marco Polo is equipped with the Smith Bracket system fore and aft to facilitate towing, so that even much smaller vessels like the Abeille Bourbon (80 metres and 209 tonnes) can manage her with ease, as was proven in this real-life test scenario at sea.